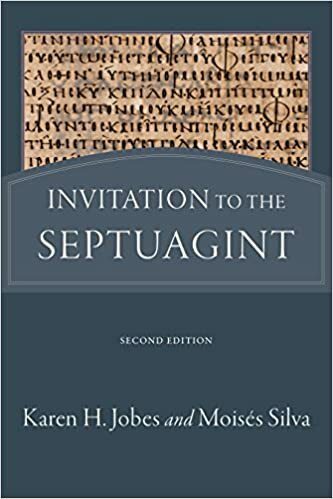 Book Giveaway: Invitation to the Septuagint by Jobes & Silva | Septuaginta &c.
You may have seen the interview that I posted recently with Karen Jobes regarding her two new books in Septuagint. One of the two is the second edition of Invitation to the Septuagint, fully updated and expanded ten years after its initial publication. As I’ve looked through this new volume, I have been happy to see a number of newer and important aspects of LXX scholarship receive good discussion. In particular the discussion of the language of the Septuagint (ch. 12) gives a nice overview of current issues. This textbook is, to my mind, the industry standard for introductions to this field of study. The main reason is that this book is truly an introduction, not assuming prior knowledge of the discipline and its many facets (except, of course, the knowledge of Greek and Hebrew). Even so, students with a basic knowledge of these languages could benefit immensely from this book as it explains the many conceptual complexities of LXX study with clarity and precision. There are other introductions that are mandatory reading, of course, but I think these are best read after Invitation as a foundation. Somehow I ended up with two copies of the book, so I’m giving one away. All you have to do is leave a comment below saying why you think it would be a helpful book for your studies. If you share this post on Facebook or Twitter, just note that in your comment and I’ll enter you twice into the drawing. Also, if your comment is a pun using Greek that makes me chuckle, you’re chances will double (including those who have shared). I’ll assign everyone who participates a number, then use a random number generator to find a winner. I’ll announce the lucky candidate the soon after the giveaway ends and get in touch via email. Chances to enter end when the year ends: December 31st at midnight. You can reside in the US or the UK to participate. My wife won’t let me buy it! I have just purchased a new Biblia Graeca and would love this introduction to the LXX. I just bought a copy of Biblia Graeca for Christmas and I would love this introduction to the LXX! I think this would be essential for my learning as the septuagint is important for the apostles as a translation of the Old Testament and I want to learn a lot about a text that is so central to Apostolic argument that offer foundations for my faith! I am also very serious in taking the text of the Bible into study so I can think critically about it more as a Christian! (https://twitter.com/meeene4) < I shared this on twitter! I am a New Testament major so having books about the Scriptures the first century church used is always helpful. I minister in an academically rigorous/curious environment, so I need to be up on the latest developments in biblical studies. I worked through the first edition many years ago, so I would be honored to keep up with the second. When the Septuagint goes clothes shopping, what shirt size does it try on? This would be helpful because I have been teaching a class on Isaiah. It would be an added benefit to get a greater grasp of the LXX in Isaiah in contrast with the Hebrew text. This book would give me more tools to read Greek in light of recent studies and discoveries, meaning I’d be able to read Greek more fluently. I’ve been wanting to read more Greek literature for the purposes of understanding the aspect system and I think this would be a…(drumroll)…perfect book to help me in reading a large corpus of Greek literature. Whoever wins this will be blessed! Thanks for your generosity! Thanks, Vincent! I’ll count your re-blog as a Facebook or Twitter share. At this time, I have yet to read a good introduction to the Septuagint. I shared this blog post on Facebook as well. I could use it in my dissertation, which has a chapter on the LXX for the Pentateuch, and one on the subsequent Greek Bible books. I want this book becuase it is impossible to find a book like this one in Spanish and there is a huge need among Spanish speaking countries to get familiar with the Spetuagint. So I will use it to teach people who don’t speak English. By the way, I shared the post on Twitter. Thank you and happy new year. It was my intent to take LXX studies this Spring as a directed study, but Ὦ τάλας ἐγώ, I cannot, for the professor who was going to do this with me relocated. I still want to embark on these studies but until another chance opens up, it will have to be autodidactic. This book sounds like a perfect start and it would bless me tremendously. I agree! You’re down for two entries for the comment + Greek pun. 1, As one of less than 70/72 LXX bloggers in the world, I’d love to own this one. 3. As soon as I click “Post Comment,” I’m going to RT this. Lovely! Read that earlier today and thought it was great! You’re in for four entries. As a pastor, I prefer to make I understand as well as possible the NT quotations of the OT, and how they may be different or similar to the LXX. So, … ‘twould be nice to read and enjoy! As a pastor, I prefer to make sure that I understand, as well as possible, the NT quotations of the OT, and how they may be different or similar to the LXX. So, … ‘twould be nice to read and enjoy! I think any book about the Septuagint would be worth while addition to our library! I love word studies and referencing LXX scriptures. Thanks for this kind offer, but don’t enter my name–others need a free copy far more than I. May many be introduced to the joys of LXX, even through this gift. Thanks Fred! As you wish. Jonathan, with the Tweet and the clever Greek comment, you’re in for four entries. Thanks! Tweeted and Facebooked but sadly I am not clever enough to come up with a pun in English, let alone Greek. Working on some stuff on Paul’s use of the LXX in Gal. 2 & 3. Well you’re in for two entries nonetheless! I echo Fred’s sentiments. No need to enter me for the tweet and the fb share. Good luck to everyone. It truly is an essential read for those uninitiated in LXX studies. You got it! Thanks for the share. I’m interested in the use of the LXX in the NT and anything by Silva is phenomenal. Appreciate your blog! Insert Greek pun here. Also about to Retweet your post on this! Very good! You’re down for two. As a New Testament geek I know the LXX is important. Shamefully, I’ve never read any of it. But since I started seminary this past fall and took my first Greek exegesis class, I know venturing into the LXX is on the horizon. I’d love to have this book as a guide. The horror! Tempted to put you down for four just to remedy the situation 😉 But I’ll stick to the house rules. Thanks for the share! Shared on FB & Twitter. Man that was pretty bad, haha. But I’ll count it for effort! You’re down for four entries. Would love a copy. The LXX is next on my list after I finish the New Testament in Greek. I just finished my first year of study in Greek. I would love a good intro to the LXX! Thanks for the giveaway. I would like to enter the drawing. I also shared the link on Facebook and Twitter. I am just beginning a ThM in New Testament and this book is on my “must read” list. I’ve only had limited exposure to the LXX and would love to dig into this book! This work is a classic and would be very helpful for preparing for my comps. Terrible pun. I loved it! I am interested in studying the Septuagint and this would be a valuable resource for my studies. As an aspiring OT scholar I would love to own this book. The LXX provides an incredibly important witness to the OT and this book would help me develop greater familiarity with it. My primary scholarly interest is in composition of OT books, of which the LXX plays a significant role. Thanks for the opportunity to win! I’m starting Seminary this year and it would be a good resource to have for my studies, especially when I start my Greek courses. It would be helpful because you can never know enough about the Bible! … and sadly the LXX isn’t something I’ve studied much … also sharing on Twitter! Need to brush up on LXX – haven’t done much with it in recent years except the occasional textual criticism drive0by. Having studied both Hebrew and Greek in the last year, I’m very interested in studying how the word choice in Greek among the Hebrew nuances affects understanding or misunderstanding of passages. I am a seminary student who loves to read scholarly work in order to serve the church. I study Greek and Hebrew on my own. It sounds like this book would be a great addition to my resources.